It seems like yesterday that we were dealing with snow cover that did not want to go away and waterlogged soils that significantly slowed the development of our lawns, mostly because it was yesterday, but those conditions have vanished and we have new challenges – it’s that time of year again – time for heat and drought stress. Lawns can suffer from two general environmental stresses during the summer months, heat stress and drought stress. A lawn can have one, the other, both at the same time or neither stress. It’s important to understand what these stresses are, how they are different, what we can do to mitigate their effects, if anything, and what the responses are by the turfgrasses. Heat stress is the response by the turfgrass to high temperatures, generally in our service area this means in excess of 90 degrees Fahrenheit. The grass species that we utilize to create our lawns in the Northern United States are Kentucky Bluegrass, Perennial Ryegrass and Fine Leaf Fescue. All three of these species are referred to as Cool Season Turfgrasses by virtue of the type of photosynthesis that they utilize. As the air temperature exceeds 90 degrees, changes in the protein structure of the plant begin to occur – the best example of this we can see is when we fry an egg on the stove. When the clear portion of the egg is exposed to heat, a process of denaturation occurs that destroys the protein structure and results in a recombination of the proteins into what we know as the egg white. Indeed, this happens in the environment just as it does in the kitchen as evidenced by the tired old trope of a television reporter frying an egg on the street during the first heat wave of the summer. This process of denaturation in the leaf tissue of turfgrass is irreversible; once it has “fried” you cannot “unfry” it. Drought stress is the reaction of turfgrasses to insufficient available water. There are many factors that go into when turfgrasses go into drought stress including what species of turfgrass we are growing, how well developed the root system is before the onset of droughty conditions, the height of cut of the lawn, the amount of water that is applied through irrigation systems, when during the week it is applied and at what time of day, competition from surrounding plants and finally the duration of droughty conditions. Let’s pull these factors apart. Root development prior to droughty conditions occurring is important as once summer begins, Cool Season Turfgrasses begin to lose root mass as soils heat up. Therefore, if you have more root mass to begin with, you have more to give away once it gets hot and dry while still having a functional root system. Of course, once the root system has been nearly exhausted, there can be no uptake of nutrients and water for survival of healthy turfgrass leaves. Height of cut impacts drought hardiness in that a taller turf will shade the soil, lowering soil temperature and inhibiting evaporation. Plants, for the most part, are mirror images of themselves below ground as they appear above ground, therefore, the more height you maintain above ground, the more depth you will encourage below ground. The height of cut should remain the same during the entire season – select a height and stick with it. Mowing between 2 ½” and 3” is best, while adhering to the one third rule – never remove any more than one third the height of the turf with any one mowing. Irrigation practices impact drought hardiness as well. If you do not irrigate, that’s fine – the lawn will react to not being irrigated just fine. But if you do irrigate, irrigate for effect. Encourage deeper rooting by spacing the times you irrigate further apart; irrigating for twenty minutes every other night is preferable to irrigating for ten minutes every night. When the soil profile is allowed to dry between irrigation cycles, the turfgrass is encourages to drill deeper into the soil to find available water. Irrigating during the nighttime hours allows for the maximum amount of water to infiltrate into the soil, instead of evaporating into the atmosphere during the daylight hours. Be careful to end your irrigation cycle before daylight – the trick to avoiding fungal infections is to limit the amount of time that water is present on the leaves. Dew naturally forms in the overnight hours and evaporates midmorning. Restrict your irrigation to the times when dew is naturally present. There is only so much water present in the soil and there is competition for it between plants. Trees consume an immense amount of water and are obviously much larger and stronger plants. Drought conditions will become evident in lawns near trees before areas without them, all things being equal. On my home lawn, a ring of brown turfgrass will become evident ten to twenty feet out from the trunk of my pine trees as the soil dries out. So, what is the turfgrass’s reaction to the stresses imposed upon it by Mother Nature? Dormancy. Turfgrasses have developed over the eons the ability to shut themselves down and preserve their vital organ, called the crown, during periods of heat and drought so that they can resume growth when weather conditions improve. This means that regardless of how diligently you mow your lawn, or how precisely you run your sprinkler system, if the plants are subjected to either heat or drought stress, their reaction will be to go dormant, and dormant means brown. You can see this process in action if you know what you’re looking for. 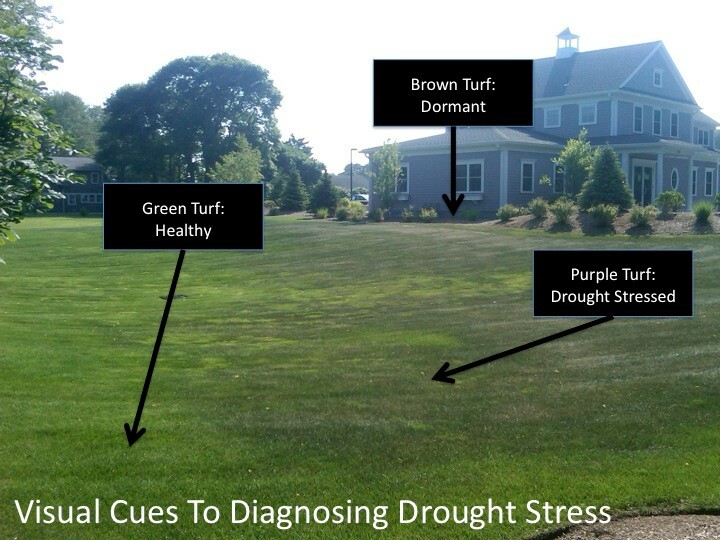 Lawns will begin showing visual cues when drought stress strikes. A lawn with ample available water will appear green in color, but as that water begins to run dry the plant begins to react to this droughty situation. A purplish cast will begin to show against the green of the turfgrass, especially during the late afternoon hours when the sun in low in the sky. This purplish cast almost appears as though there were a shadow being cast across the lawn by a big tree or a building. I began seeing lawns turning purple on this past Sunday, including the lawn depicted in the above photograph, even though that picture is about four years old. The pattern is almost exactly the same today as it was then. There really isn’t anything we can or should do to reverse this process once it starts, as it is completely natural and organic. What’s more, it helps to ensure that when weather conditions improve that there is a living turfgrass crown that can resume growth and give us back our green lawn. The flip side of this argument has to do with our arch nemesis – crabgrass. Why do all of these awful things happen to the turfgrasses that we are trying to grow but not to crabgrass? It seems to explode in growth just as our lawns are browning out. It’s just not fair, not fair at all! There is a simple explanation – crabgrass is actually a Warm Season Grass that utilizes a completely different type of photosynthesis and respiration than does our Cool Season Turfgrasses. When temperatures go up, crabgrass grows faster and better, much like corn does, another Warm Season grass. Crabgrass also has fantastic drought tolerance – long after the Cool Season Turfgrasses have passed into drought stress, the crabgrass is still going strong.